Although our genes remain those of our prehistoric forefathers who were roving hunters and gatherers, we have long since become sedentary as far as our physical lifestyle is concerned. All the more important is not to neglect sports activities. With the Beck & Beck move concept you choose a valuable form of prophylaxis while actively supporting the health of your heart and circulatory system, strengthening your immune system and slowing down the processes of aging and degradation of tissue. Metabolic disturbances are a major problem in the sphere of Western culture. These disturbances can only be countered by suitable forms of exercise and strengthening of the musculoskeletal system. In addition, increasing your oxygen absorption capacity can permit you to maintain your physical and mental flexibility into old age. Pressure generates counterpressure. Constant psychological stress sooner or later puts negative pressure on the body. 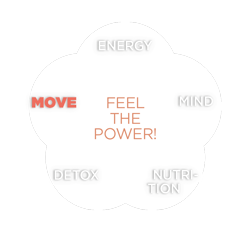 We supply you with new energy to fuel your natural impulse to move. You can trust our decades-long experience in the area of the musculoskeletal and supporting system. With the help of specially designed treatment programs we can prevent many problems from developing and/or treat existing problems. The success formula of the Beck & Beck move concept is individualized exercise coaching, fitted to your specific needs in order to raise your level of personal fitness – accompanied by a totally new wellness feeling!